In recent years, the international community has been discussing the use of alternative energy sources. In the last century and now both oil and gas are still the main sources of energy and the issue of reducing the volume of their use should be addressed virtually in every country. Experts predict that in 2016-2017 oil demand will grow slowly. At the same time, the increase in demand for “black gold” will also promote the consumption of fuel ethanol as the most feasible alternative to crude oil. Compared to 2015, in the coming years the world economy demand for oil will increase by 1.8 million barrels per day and will amount to 98.8 million barrels per day as a whole. The United States which, for example, in 2015 consumed 19.4 million barrels of oil per day, stands out among the largest oil consumers in the world. Fig. 1 shows the oil-products yield from one barrel of oil. alternative types of fuel (oxygenated gasolines, gasolines with ethanol). methyl tert- amyl ether (MTBE). In 2015, 1,000 million tons of gasoline was used worldwide. The biggest consumer of this oil-product is the United States (about 40% of total consumption volume). Asia and Pacific countries are running second to the US – 21.6% of world gasoline consumption volume (almost half of it is used by China and Japan). The countries of Western and Eastern Europe consume 17%. The largest increase in the dynamics of gasoline consumption was observed in China – 46.9%. As at the beginning of 2015, there were registered 636 oil refining factories in the world with a total capacity of 4.63 billion tons of oil per year. 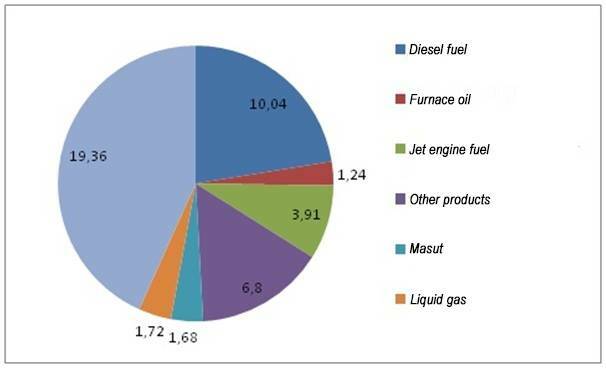 In recent years, European gasoline component composition was as follows: Fuel catalytic cracking to produce gasoline – 30%, catalytic reforming for high octane gasoline – 50%, alkylated products – 5%, isomerization products – 8%, additives – 7%. Experts point out that among the European manufacturers Germany has the most successful component composition of gasoline. Today in Europe there is EN 228 standard, specify norms for ethanol mixtures. According to EN228, Euro 5 (European emission standard) for gasoline is: Aromatics (35%), Benzene (1%), Olefins (18%), Oxygen (3,7%), Sulphur (10.0 mg/kg). The document is periodically reviewed for the content of ethanol in mixtures from E5 to E10. From 2007, the E85 gasoline standard (benzene – 15% ethanol – 85%) began to officially operate in France and Austria, and from 2008 – in Germany. Generally speaking, today about 40 countries already use E85 gasoline standard. In addition to general standards, European Union countries also have internal standards for ethanol mixtures, corresponding in quality to general standards. The following symbols are used to indicate bioethanol and mixed gasolines. First comes letter E (for «ethanol»), and then a figure showing the percentage of ethanol in the fuel. According to statistics, the most common mixtures are: E5, E10 and E85. In some countries, particularly in Brazil, pure ethanol E100 is used. There are 149 oil refining factories across the US with total capacity of 872 million tons, accounting for 20.5% of global oil refining. The US gasoline blendstock is : catalytic cracking gasoline – 34%, reforming gasoline – 28%, alkylate – 12%, isomerate – 4%, additives – 15%, and others – 7%. Table 1 shows the statistics of global gasoline consumption. Fuel ethanol is the most capacious product that is added to gasoline. In 2015 it global gasoline production amounted to 15.200 million gallons. Today, there are 575 factories in the world, producing ethanol. Their total capacity is 80.631 million tons. Most often, ethanol is derived from sugarcane, corn, wheat, sugar beet, etc. Consumption of ethanol fuel in 2015 was 85 million tons, which is equivalent to annual consumption volume of such countries as the Netherlands and Poland combined. Table 2 shows the average price of gasoline and fuel ethanol. Today the production of biofuels (including bioethanol) is connected with preserving the environment and a fight against global warming, which requires switching using oil and gas to alternative renewable types of fuel.